The most basic of all soccer skills is dribbling, the ability to carry the ball past an opponent while being in control, whether by using a series of simple taps or a fantastic move around a foe. If a player can’t dribble a ball, then he cannot play the game. Every player, including the goalkeeper, must be able to dribble the ball at some level of competency. Some time during a game you will be called on to move the ball on your own, whether you have open space or all available teammates are covered closely by the opponent. Dribbling is a lost art these days. Many coaches — youth, amateur, and pro — downplay the role of the individual and emphasize teamwork. There is certainly nothing wrong about passing the ball to a teammate. But, in a match, you may be forced to dribble in a tight situation or have the chance to take on an opponent to create a scoring opportunity or even score a goal. Many times, knowing when to go off on a long dribble and when to pass to a teammate comes down to timing, awareness, and experience. If you dribble through two or three players and then lose the ball to a fourth, you’re wasting your time. You have to know the strengths and weaknesses of the opponents before taking that kind of risk. The best players in the world play as though the ball is part of their foot, moving the ball swiftly without looking down. Take a look at the way they dribble the ball. Dribbling is very natural to them, as if they were born with this skill. Saying that, even the greatest players needed to perfect dribbling over a period of years. Most people usually favor one of their feet as the superior skilled foot to dribble the ball in close quarters, although both feet also are used. The key to dribbling is to kick the ball ever so lightly with both feet without losing control at a comfortable speed for you. You should touch the ball with the inside of your shoes, for the most part, for better control (see Figure 1). Figure 1: The basic dribble. The most common mistake made by a beginner is constantly looking down and not knowing which direction you’re going. You literally run into trouble, whether it is the opposition or teammate. You won’t know where you are on the field, and you won’t have the ability to make quick decisions to help your team. 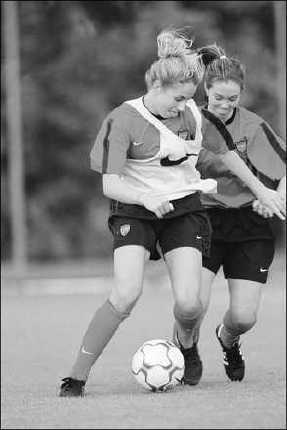 As you become more comfortable with the ball, you pick up speed and become more confident — unless you are gifted, dribbling speed comes only with time. As long as you follow the proper techniques, you can never do enough dribbling. The best thing about dribbling is that you can practice by yourself. If you practice enough, you may even invent a move or two! Before attempting to change directions, you first need to make sure that you have enough space to turn with the ball. You should turn away from your opponent and then use the inside or the outside of your foot, depending where the pass is coming from and where the opponent is (see Figure 2). Figure 2: Turning the ball. You must avoid exposing the ball to the defender or turning into the opponent. After performing the move, you must accelerate your dribble. As you dribble, always try to keep your body between you and your opponent. Here are four techniques that will help you accomplish that goal every time. The Cruyff move: Named after Dutch master Johan Cruyff, the Cruyff move is used to surprise the opponent by shifting your weight in one direction and running in another direction. To do this move, fake like you’re kicking the ball with your right instep and then step past the ball with your supporting foot (left foot). Then rotate your right foot so that your toes point downward. Then use the inside of your right foot to make contact with the ball so that it rolls behind the support foot before you play the ball with your left foot. Scissors move: Like the Cruyff move, the scissors move is used to unbalance a foe. Use this move to switch the ball from one foot to another in an attempt to confuse the opponent. The ball starts on your right foot. Step over the ball with your right foot as you shift your weight until the ball is under your left foot. Then dribble away with the outside of your left foot. 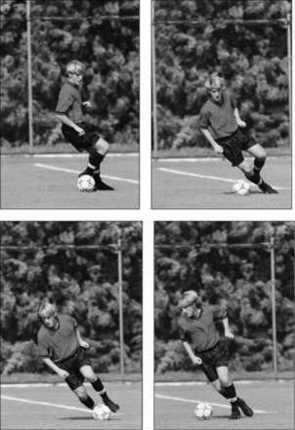 Zico move: Brazilian midfielder Zico originated this move, which also leaves a foe unbalanced and a step or two behind. You fake to hit a pass with your foot. You then step over the ball with your right foot as it winds up in front of your supporting (left foot). Spin clockwise, while keeping your body between the ball and defender. Then use your instep to take the ball with your left foot before accelerating. Shielding the ball: Sometimes you can’t pass the ball when you want to because you’re waiting for a teammate to get into position. That means you have to keep the ball away from the defender, as shown in Figure 3. Figure 3: Shielding the ball. To shield the ball, stand sideways to the defender, keeping your body between the opponent and the ball. You also should extend your arm closer to the opponent for balance and to make more room between you and the defender. While doing all of this, keep the ball and your foot away from the opponent and your head up to see what options are open.